The revitalization of a new era of collaborative, innovative, economic development in the North and North East of Tasmania! As part of the REDP and agreement by Council Members to fund and support a Regional Model, NTDC launched the Regional Economic Modelling Tool as one of the sub-projects to the REDP. It ensures all Council Member officers and the regional communities use one set of data to determine the economic impacts of projects and activities in the North and North East. It also provides economic and social data at the individual LGA level – so it will be useful for us all! To check out this great new tool go to this link: https://economy.id.com.au/northern-Tasmania NTDC were excited to launch the Regional Model on the 21st of March through a workshop with Ryan James of .id with our councils’ members. The roll-out of the Model will continue at the end of April with a second round of workshops for our council members announced. See video on our Facebook page to hear what Bruce Williams, City of Launceston and Ryan James, .id discuss the benefits of this tool following the recent launch. Increase net exports by between $1B – $1.75B per annum from our Business as Usual case. Increase our working population by at least 6,000 (our current population trend is a decline in our working population – see table below). Increase annual investment in business plant and equipment and public infrastructure by between $150M – $250M per annum above central levels. Increase the focus on place making outcomes to ensure that the region attracts and retains the entrepreneurs and skilled working age population required to grow our economy. Whilst challenging, the National Institute of Economics and Industry Research (NIEIR) have indicated these changes are not insurmountable – but will require unified, dynamic regional leadership and governance. 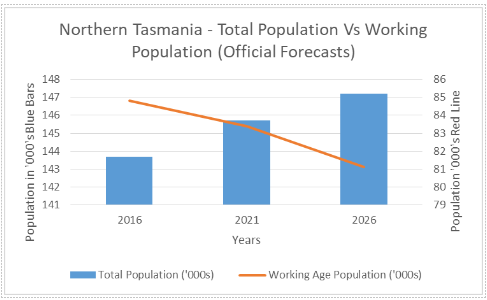 NTDC is in discussion with Council Members, the Launceston Chamber of Commerce, and other stakeholders, to establish a Population Taskforce which will focus on what will be required to deliver the working age population we will need. 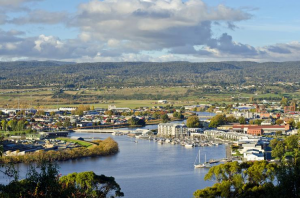 Read the article in the Examiner on the new Taskforce for Northern Tasmania here. Karina Damberges, Director – Small Business: Karina has significant experience business development roles throughout Australia in a range of business from small, family-owned businesses through to large multinational organisations. Karina’s current roles include the Director of Operations of the Van Diemen Project and Director/cofounder of three regional based businesses in the craft fermenting industry. Karina has a strong focus on growing and building businesses through innovation, collaboration and investment. She believes that regional economic development is not just the responsibility of government and requires active engagement across the local business eco-system and community to achieve common goals. Adam Poulton, Director – Digital Transformation: Adam is a Businessperson and Entrepreneur with a particular interest in digital futures and how communities can benefit from disruptive technologies. He is an experienced board director who has served with numerous industry and local government organisations, such as Bitcoin Association of Australia, Blockchain, The Future Group and TasICT. Furthermore, the NTDC board acknowledges the contribution Adam Mostogl has made to the organisation in the role of Director – Digital Transformation. Adam’s business, Illuminate Education & Consulting, is growing from strength to strength and now requires him to spend a substantial amount of time interstate. He departs with our thanks and best wishes. FermenTasmania have cleared the first hurdle towards the FIAL Cluster Support Program funding! NTDC, along with such a broad group of similarly focused FermenTasmanians, have put forward our support and look forward to seeing the outcome of the submission. The Department of State Growth is once again pleased to offer Tasmanian business and community groups the opportunity to attend the free information session on how to build your skills in preparing and writing successful grant application. The information sessions will unpack the submission process and what’s involved in putting together an application, then the masterclass will delve deeper with time for you to work in your own project. Click here to put yourself on the waiting lists and for more information.